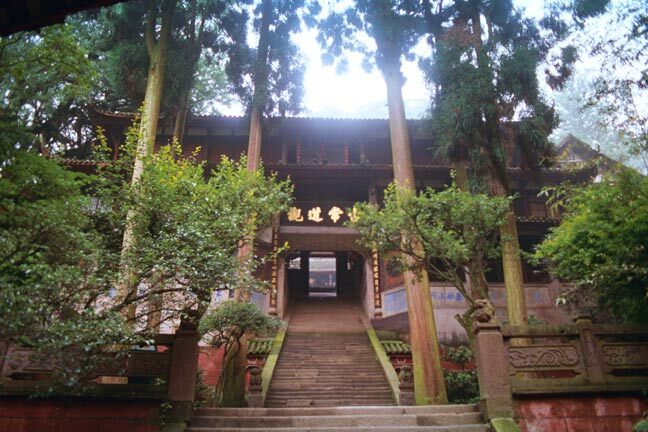 Entrance to Tianshi Dong, Cave of the Heavenly Master Temple, our lodging when we stay on Mount Qingchenshan. Skillful demonstration by students of the Qingchenshan Wushu Academy. Inner courtyard of Tianshi Dong, Cave of the Heavenly Master, Temple. Old hand painted map of Mount Qingchenshan. This mountain gate marks the entrance to Mount Qingchenshan. Master Tang, Abbott of Tianshi Dong, demonstrates his mastery of Chinese brush painting for our group. Rebecca Kali, our trip leader, and Master Tang with Chinese brush painting he has just completed. Rebecca Kali and Mark Johnson with Master Tang and other Daoist display gift of Master Tang's Chinese brush paintings. Pretty pavillions along the trail provide a lovely place to rest and chat with other travelers.